"Black Team, rock and roll!" Fireteam Spartan: Black, often referred to as Team Black or Black Team, was an unconventional warfare unit of four SPARTAN-II supersoldiers who reported directly to the Office of Naval Intelligence, unlike their Naval Special Weapons comrades. Late in the Human-Covenant War the team was issued MJOLNIR: Black, which included components later incorporated into the MJOLNIR Mark VI armor. Their armor was painted matte black rather than the green color scheme normally used by mainline SPARTAN-IIs. While being trained by SCPO Franklin Mendez, Margaret and Otto secretly had a romantic relationship. Victor was jealous of them and reported them to Mendez, who sent both to the brig. Red Team heard of this and tracked down Margaret. In the ensuing struggle, Margaret lost her left eye to send the message that her team should take their training seriously. Soon, Black Team gave Red Team a beating in return and were given a ten-day stint in the brig as a result. The team would never speak of the incident again. Black-Two rescues Three on Verge. In mid-2552, Team Black was sent to destroy a heavily fortified Covenant mining device within the ruins of Ciudad de Arias on the UEG colony world of Verge, to cut off the supply of energy to ships blockading Tribute. Roma encountered an apparently non-hostile Yanme'e, and convinced the other members that they could trust the alien for intelligence on the area. Hopalong, as the Yanme'e was nicknamed, led Team Black through underground tunnels that were hollowed out by swarms of Yanme'e. Roma, during their attack on the Mgalekgolo and Kig-Yar positioned by each anti-gravity pylon, discovered that the Yanme'e were psychopathic prisoners rather than slaves as Hopalong led them to believe. Team Black was able to set C-12 explosives just before Hopalong freed the hostile Yanme'e inmates. Although Otto struggled with the swarm and was ultimately rescued by Roma, the team escaped the area and the charges on the pylons were detonated. Iona: "Congratulations, boys. You've discovered a heretofore unknown alien species." Victor-101: "Oh. Yay for us." Some time after the mission on Verge, Team Black was assigned to Operation: BLOWBACK, a covert mission to Sub-Sector 35 in uninhabited space, believed to be a significant Covenant supply route. They were assigned aboard the ONI-commissioned civilian mining vessel Long Time Coming, with their cryo chambers hidden among prospecting equipment, with a mission to board or allow themselves to be "captured" by any Covenant vessels in the area, gather intelligence and then destroy the ships from the inside. The AI construct Iona was also assigned to assist the team in their mission. However, on its way to Sub-Sector 35 in slipspace, the Long Time Coming was significantly damaged by unknown bursts of energy. After the ship crashed on an uncharted moon, Victor was assigned to carry Iona within his MJOLNIR suit. After Margaret was captured by mechanical Gatherers, Victor and Otto reluctantly allied with the Covenant forces also on the moon in order to rescue their captured comrades and proceeded inside the vast Line Installation 1-4. While they were closing on the chamber where the captives were being held, the Forerunner monitor of the installation, 686 Ebullient Prism, hacked into Victor's and Roma's MJOLNIR HUDs, tricking them into attacking each other. Four was also reminded of his grudge against Otto and attacked him, before Three and Iona managed to remind him of the importance of his adopted family and snap him out of his tantrum. Meanwhile, Margaret managed to escape her cell with a Sangheili, Reff 'Talamee, and they found their way into the control room of the facility. Otto, Victor, and Roma then assisted Margaret against Prism in the installation's control room. Margaret managed to destroy the monitor with the installation's main gun, simultaneously bringing an entire Covenant fleet crashing down. Team Black then went out to fight the survivors so as to commandeer a functional slipspace drive to get off the moon. Team Black ultimately escaped the moon and returned to UNSC-controlled space. By July 2557, Black Team had been assigned to Installation 03. On July 25, shortly after the Ur-Didact's attack on Ivanoff Station, Team Black was serving as security detail for a science camp in a desert on the Halo's surface. Unaware of the recent attack on Ivanoff, the Spartans were attempting to establish contact with the station when they noticed a large number of objects exiting slipspace and falling from the sky; one of the objects crashed nearby, prompting Black to investigate. The team made their way to the impact crater and discovered an unconscious Didact, who had been knocked into a slipspace rupture by John-117 during the New Phoenix Incident. Unaware of who the Didact was, Team Black speculated the arriving objects to be an invasion force, though one member questioned the efficacy of the invaders given the Didact's unresponsive state. However, the Didact suddenly awoke. Furious at the sight of more Spartans, the Didact declared the humans' presence "unacceptable" and brutally killed Team Black along with the nearby scientists. Following the loss of contact with Black Team as well as the scientists, Admiral Terrence Hood sent Blue Team to Installation 03 to investigate the disturbance. 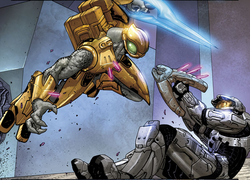 Upon their arrival the next day, Blue Team found all four members of Team Black dead and were attacked by Promethean constructs shortly after. 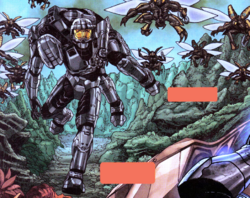 Halo: Blood Line and Halo: Escalation depict the team members' visors with Roman numerals of their respective team tags. The comics also show their visors as gold whereas Blunt Instruments states they are reflective silver. Team Black training against Red Team with paint pellet guns. Black Team fighting in the Line installation's control center. Black Team engages Covenant forces gathered outside the installation. Team Black's corpses are found by Blue Team.